It's not the novelty some claimed it once was to see women working in prominent roles throughout the local beer world. The growing recognition for women involved can be in part attributed to the work of the Pink Boots Society, which was imported from the US and has steadily grown over the years here, with state chapters opening across the country. They've gained acknowledgement (and raised funds) predominantly through a series of brews carried out at breweries across the country for which as many women as possible gather. For the Neneh Cherry Saison brew day at Two Birds Brewing, the brewery team was joined by representatives from Two Row Bar, the Beer Diva, Mountain Goat, Beer Deluxe, Rockwell & Sons, The Junction Beer Hall, Little Creatures Brewing, Good Beer Week, Kettle Green Brewing and many passionate supporters of good beer. For the beer, 200 litres of "pure, unadulterated" cherry juice was donated by CherryHill Orchards with hops coming from Hop Products Australia. According to the ladies: "We hopped the beer with US El Dorado, known for its Cherry Jolly Rancher-like characters and Australian Enigma to give bright, clean, grape-like notes. The beer was fermented with a French saison yeast, to bring the funk. 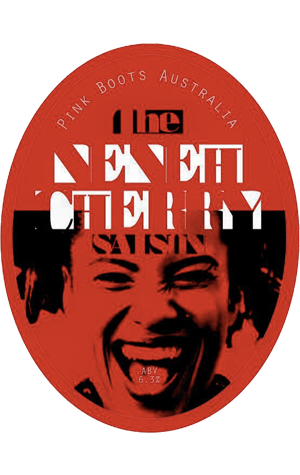 "The Neneh Cherry Saison is dry, complex and hoppy, with a hint of juicy cherry notes, a nod to the 'staunchly counter-culture' of the inspiration for this beer, Neneh Cherry." Proceeds from all of these collaborative beers are channeled into the Pink Boots Society’s scholarship fund whereby women who earn an income from beer, can apply for various grants offered throughout the year.